Jarome Iginla spent more than a decade with the Flames, then chased a Cup with the Penguins. Can he finally win hockey's greatest prize with the Bruins? At the TD Garden in late December, we were treated to a Very Special Holiday Episode of hockey. The principal players were the Boston Bruins and the Buffalo Sabres, but a weird giddiness filled the whole place. Christmas was coming in a few days, and before the pregame introductions, fans watched a montage of goals, body checks, and random punch-ups, all coordinated to the Trans-Siberian Orchestra’s bubblegum-metal version of “Carol of the Bells.” (Nothing says Christmas like slugging a Maple Leaf.) Virtual snowflakes fell from the rafters, mottling every corner of the arena with light. The folks caught on the big screens during stoppages in play smiled a little wider and danced a little more enthusiastically, if not particularly more artfully. Rene Rancourt, who sings pregame national anthems, and altogether looks like the father of the guy Clive Owen played in Croupier, sang some holiday favorites between the second and third periods. The team ran a Christmas-themed installment of its video series, The Bear and the Gang, in which various Bruins were shown engaged in assorted festive silliness while a large man in a bear suit drifted in and out of frame. Carl Soderberg was trying to wrap a plastic goose. And, at one point, the man in the bear suit was sitting on a couch. On his lap, looking quizzical but unquestionably game, was Jarome Iginla, all 17 NHL seasons and 500-odd NHL goals of him. He and the guy in the bear suit got a very big cheer. It had been a strange week for Iginla. The Bruins had just returned from an extended tour of western Canada during which Iginla found one of his fingers turned into a parenthesis, an injury so grotesque that it became an Internet Instant Classic. Earlier on that same trip, he had returned to Calgary, where he played for more than a decade. The Flames showed a tribute video that resulted in a two-minute-plus standing ovation they could hear in Banff and, at the end of the game, when Iginla was awarded the night’s third star, he skated back out for another thunderous greeting, only to find his way off the ice barred by his teammates from Boston. The rapturous applause went on and on and on. It was such a hockey thing for the Bruins to do. The Bruins, who face the Islanders tonight, are the second group of guys to whom Iginla has had to become accustomed in as many seasons, after spending his first 16 years in the league with the Flames. Last season, when Iginla was winding up the final year of his contract, with Calgary sunk deeply in the standings, it became plain that the Flames were shopping him. 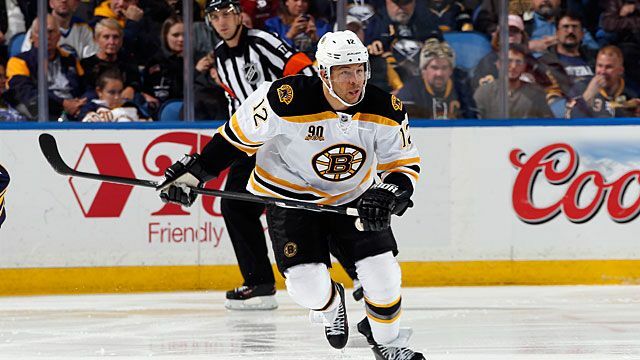 Then, a week before the trade deadline, he appeared to be headed to the Bruins; after Iginla was held out of a game against Colorado at the end of March, it was reported that a trade with Boston had been completed. Instead, to the surprise of almost everyone wearing a garish clip-on NHL logo on the pocket of his blazer, Iginla went to Pittsburgh. This became ironic when Boston beat the Penguins like little tin drums in the playoffs and then advanced to the final, where they fell to the Chicago Blackhawks in six games. This became doubly ironic last summer when, now bargaining as a free agent, Iginla signed a one-year, $6 million deal to play for the Bruins. If this is what the cold-pizza morning at the end of a great hockey career looks like, Iginla’s making the most of it. It’s Christmas and you’re new in town. This is the best for which you can hope: a big hand from the local fans and the warm embrace of some guy in a bear suit. Ah, hockey. It brings out the misfit toy in all of us. He grew up in Edmonton, admiring Grant Fuhr — the goalie on the great Oilers championship teams of the 1980s — at least in part because Fuhr was one of the few black players the NHL ever had seen. His mother was a massage therapist and a music teacher. His father was a lawyer from Nigeria who moved to Canada and changed his name to Elvis. The family name means “Big Tree” in Yoruba. Young Jarome was given the full name of Jarome Arthur-Leigh Adekunle Tig Junior Elvis Iginla, which is a very full name indeed, and he built his career in Calgary and became a star. He has won at every level and wherever he has played. In junior, he was part of two Memorial Cup championship teams with Kamloops. He got the Flames to the Stanley Cup final in 2004 and played on two Canadian Olympic teams that brought back gold medals. But the Flames got worse around him, and Iginla encouraged the team to send him someplace he might have a chance to win a Cup before his career was over. He’s not as fast down the boards as he once was, but his hands, eyes, and creative mind are still there and as sharp as ever. With 18:18 left in the second period against Buffalo, Iginla started a rush up the right side. David Krejci, the deft playmaker who centers Boston’s first line between Milan Lucic and Iginla, went steaming down the middle of the rink. Iginla spotted him and fed him perfectly. Krejci buried the shot, giving the Bruins a 2-1 lead. Nobody really knows the exact formula for assembling a hockey line. Some people say it’s better to put three veterans together. Others say the right thing to do is put three young players together early in their careers and just leave them for as long as possible. There’s instinct and guesswork and all the risk always entailed in leaving your best plans to human beings to execute. “It’s funny,” Krejci said. “Sometimes, you get a line and it clicks right away. I feel like the right way is to start OK and to keep building the chemistry. And I think that’s what we’ve been doing. We were finding each other in great scoring areas. “There isn’t any timetable,” Iginla said. “If it’s working, the longer you play together, the better it gets. I think there’s room for improvement, though. It still feels like it’s going to get better. We’ve been kind of pushing through different things, and I feel like it’s going to keep getting better. If you can just stick with it, it will work. Tonight, Looch gave me a pass, goalmouth, and Kraytch gave me a backdoor, and I went backhand, and I don’t know where it went. On good days, when you’re feeling it, those go in, and I know they will again.” Which is supposed to be how it works, at Christmas, when what appears to be the end of a long road looks more and more like a beginning.